Roshni Mathur, 17, has been a bit worried for the past few days. Despite topping her school—the highly regarded St Michael’s in Patna—with 96.5 per cent, she has not been able to firm up her mind on what to do next. She cannot decide on a subject to take up in college. She regretted taking science in plus two, but it was not quite a bummer, either. She liked biology. And, she loves reading on society, culture and politics. “I would really like to get an exposure to all the subjects before deciding which one I want to deep dive into,” she said. “I also feel that every subject has a different perspective to offer on things around us, which would be interesting to understand.” Roshni is likely to choose an arts college which follows an interdisciplinary approach to learning. Boundaries are blurring. Colleges have realised that interdisciplinary learning is the way to go. Regulatory provisions prevent them from offering liberal arts, but top colleges across the country are trying to embed multiple disciplines within the curriculum and offer a balanced view to students. Life, after all, is not in silos. Situations require application of different disciplines, and an interdisciplinary approach helps students develop critical thinking. The concept of interdisciplinary education goes back to the days of Leonardo da Vinci, who redefined excellence not only as an artist and poet, but also as an inventor and scientist. The Leonardo Effect, in fact, is an effective interdisciplinary teaching methodology based on the synchronised integration of disciplines and incorporation of skills. The Yashpal Committee on Renovation and Rejuvenation of Higher Education, in 2009, emphasised the importance of including several disciplines in one stream. Interdisciplinary experiences, it said, could help students sustain themselves when demands of a particular job market change. “What we have currently is a steel box of a system within which there are smaller boxes with no interaction with the outside or with each other,” said the report. Not any longer. 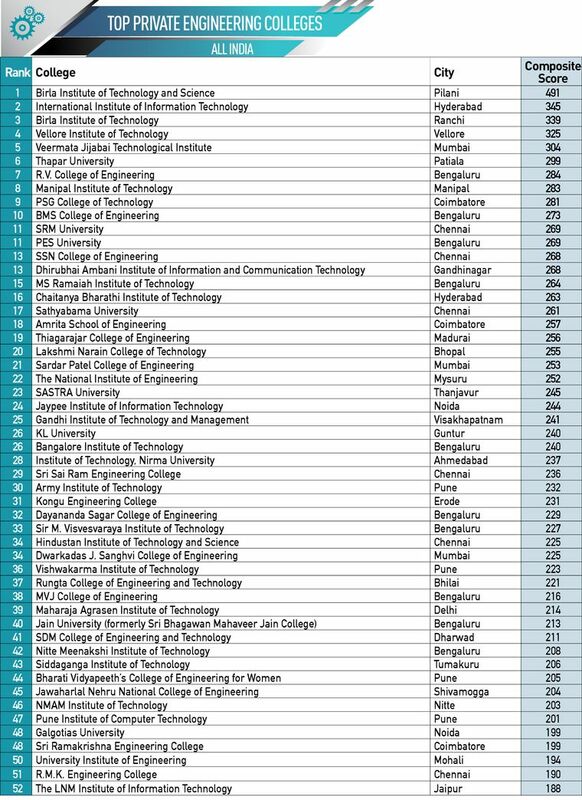 Colleges are taking baby steps to include multiple disciplines in their courses and the Indian Institutes of Technology have taken the lead. 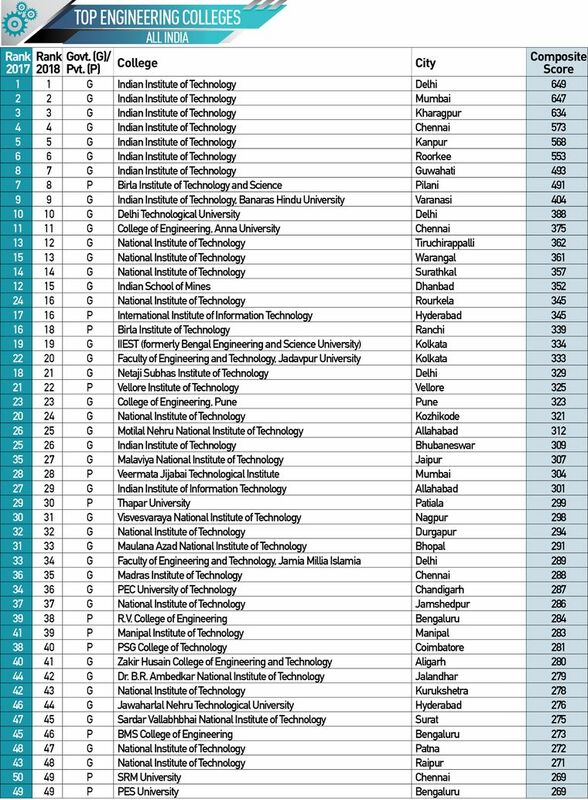 IIT Delhi, which topped engineering colleges in THE WEEK-Hansa Research Best Colleges Survey, offers five-year dual degree undergraduate programmes. 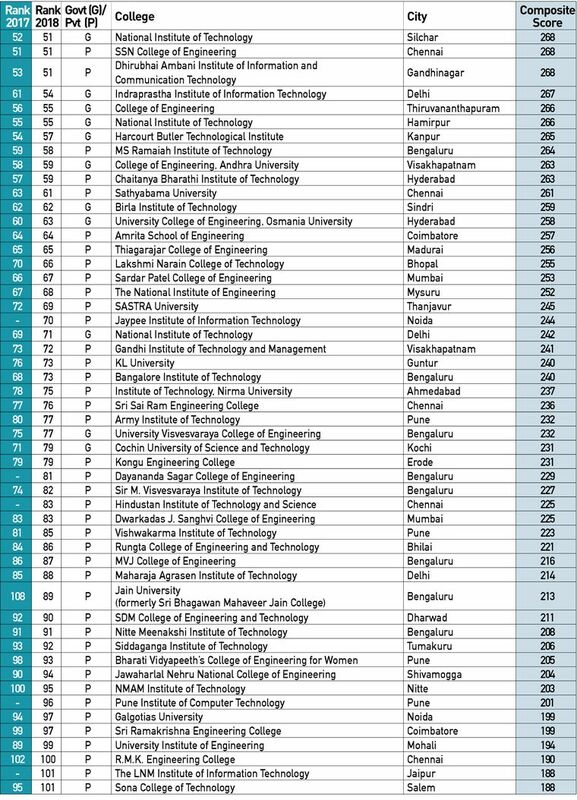 For instance, one can do a BTech in biochemical engineering and an MTech in Biotechnology, or a BTech in chemical engineering and MTech in process engineering. The institute has started the School of Interdisciplinary Research, which has undertaken some interesting projects. One such project is on creating blast-resistant structures using advanced materials and systems. IIT Delhi’s mechanical engineering and civil engineering departments are working together on the project. There are several other projects in the pipeline. The institute also plans to collaborate with the All India Institute of Medical Sciences and Jawaharlal Nehru University for future projects. And, it is not just science and technology. IIT Kharagapur has combined science and psychology to come up with a course in the science of happiness. Conducted by the Rekhi Centre of Excellence for Science of Happiness, it is available as a micro-credit course. “It is an interesting course where we are analysing happiness not just as a science. 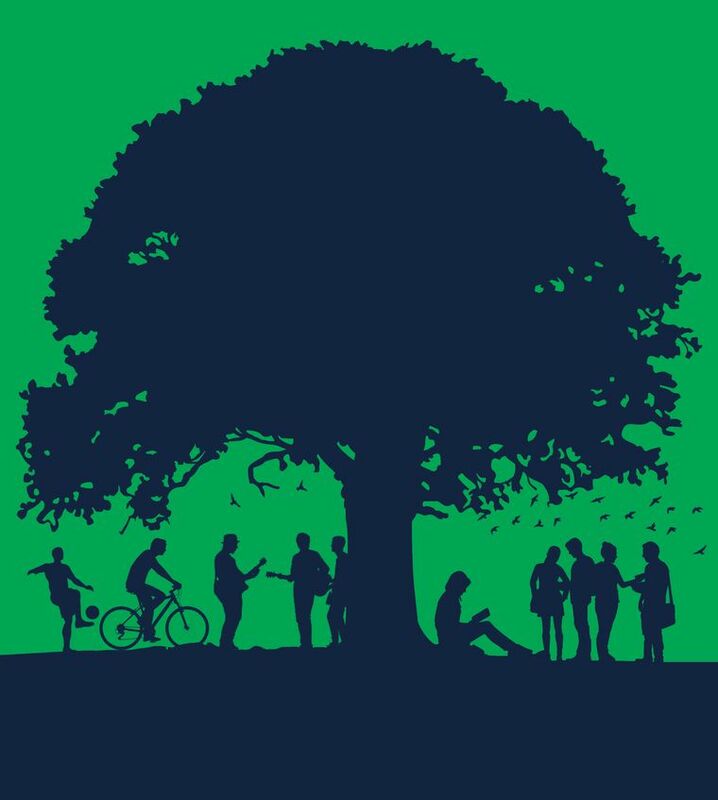 We are looking at several facets of happiness—the cultural dimensions, creativity and happiness, leadership and happiness, its connect with well-being and ecology,” said Professor Priyadarshi Patnaik of IIT Kharagapur. The impetus on bridging the gap between arts and science is set to increase, as technology gets more entrenched in human life. 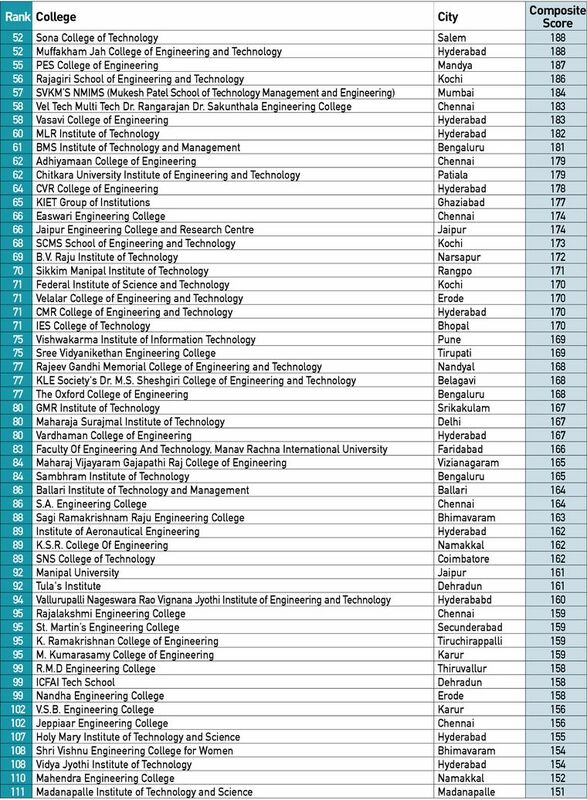 Last year, while revising the engineering curriculum, the All India Council for Technical Education said all engineering students would have to study humanities, social sciences, environment science, the Constitution and Indian traditional knowledge. IIT (Banaras Hindu University) Varanasi is redesigning most of its courses to teach humanistic studies through a newly formed department. It has handpicked ten faculty members for the department. The institute has been putting emphasis on combining various disciplines, especially humanities with technology. In one such project, students from the humanities department and the computer science department worked together for machine translation of languages spoken in eastern Uttar Pradesh and Bihar. They created a software which could translate Bhojpuri, Magadhi and Awadhi dialects to Hindi. 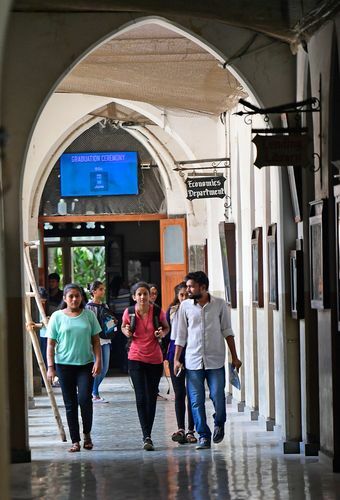 Undergraduate students at St Xavier’s, Mumbai, have to study a cross-faculty course in their fourth semester. These courses are from outside their stream and give them a completely different perspective on a subject. The arts department offers courses to science, and vice versa. Science students can choose from a wide range of courses like Gandhian studies, fundamentals of Indian Constitution or international economics. Arts students also have interesting choices—the art of mathematics, chemistry and society or garden art. A few of the students of Miranda House are working on a mobile application for lab experiments. “In schools in rural areas, there is a huge issue of no access to labs or poor quality labs. So, we are developing an app called Mobile My Lab, through which experiments can be done. We have included several experiments that schoolchildren are required to do,” said Nisha Sella, an MSc student. While she is from life sciences, the other team members are from chemistry, physics and computer science. Another group of students from various disciplines did a project on the Yamuna, in which students looked at the river from different perspectives, such as its socio-cultural relevance and the pollution issue. Students from sociology, geography, economics and chemistry came together for the project. Loyola College in Chennai, which is the top-ranked college in south India in arts, science and commerce streams, has ancillary papers offered by different departments that students can choose from. So, if someone is studying English, she can take up social history of England, which is offered by the history department. What has given a major boost to interdisciplinary courses is the choice-based credit system (CBCS). It allows students to have a choice of courses or subjects within a programme. The emphasis is more on students earning the prescribed number of credits to qualify, rather than being herded to come out successfully within the stipulated time for the degree. It is gaining popularity among the higher education institutions, as it allows students to customise the programme to suit their requirements. They can decide what courses they would like to do and choose the difficulty level of the course. Apart from interdisciplinary learning, an area which has seen a lot of initiatives coming from colleges of late is social engagement. 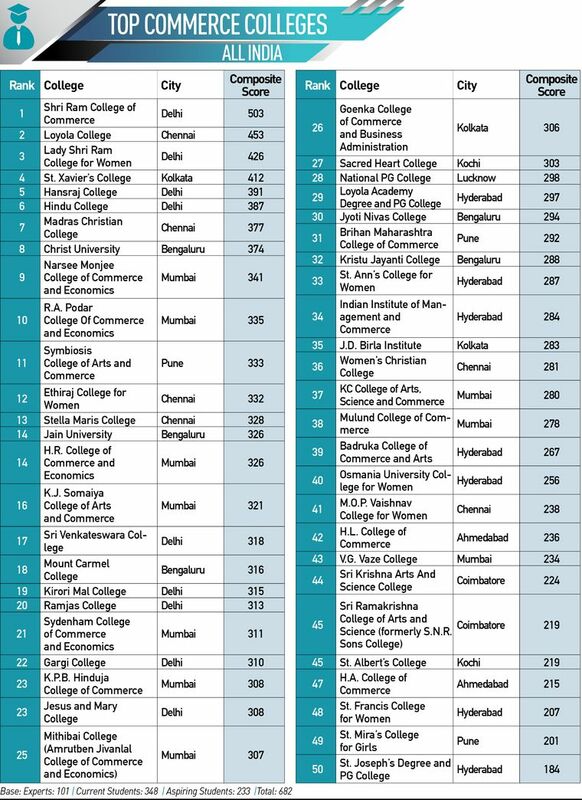 Colleges are becoming active on the community outreach front, as they have realised that academic knowledge on its own is not good enough to solve issues facing the country. Said Professor Rao of IIT Delhi, “The idea is to not just publish papers, but solve real-world problems.” IIT Delhi has launched a rural internship programme to expose its students to real-life challenges and encourage them to develop technology solutions for those problems. Hansraj College students hold evening classes for poor children from nearby areas. They distribute extra food from the hostels to the poor and the needy. Students of LSR, through its Basta project, teach women in the nearby Zamrudpur village to make bags. Loyola College in Chennai helps poor children in villages learn English. Narsee Monjee College of Commerce and Economics in Mumbai has 120 hours of mandatory social work. “Our students have worked in several areas—building toilets, giving computer education, making people aware of government schemes. They also visit senior citizens and make them technologically aware,” said Dr Parag Ajagaonkar, principal of the college. Owing to the overwhelming presence of technology, there have been concerns that the education system is not doing well enough to teach students values, ethics, the importance of relationships and how to care the environment. Colleges have started taking cognisance of this aspect. St Xavier’s in Mumbai, for instance, has three mandatory courses—giving voice to values, environmental studies, and human rights: duties that piggyback on rights. Environment gets a lot of impetus at Miranda House. “Our students campaigned for ‘no posters’ during the Delhi University Students’ Union elections, and they went on ripping off posters to keep the university premises clean,” said Jolly. The college has its own paper recycling plant and a compost plant. Most these colleges are also working on building bridges with schools. Miranda House, for instance, organises the Inspire Internship Camps for school students every year. The programme includes motivational talks by renowned scientists to inspire students to take up a career in science. Hansraj and LSR, too, host such programmes. 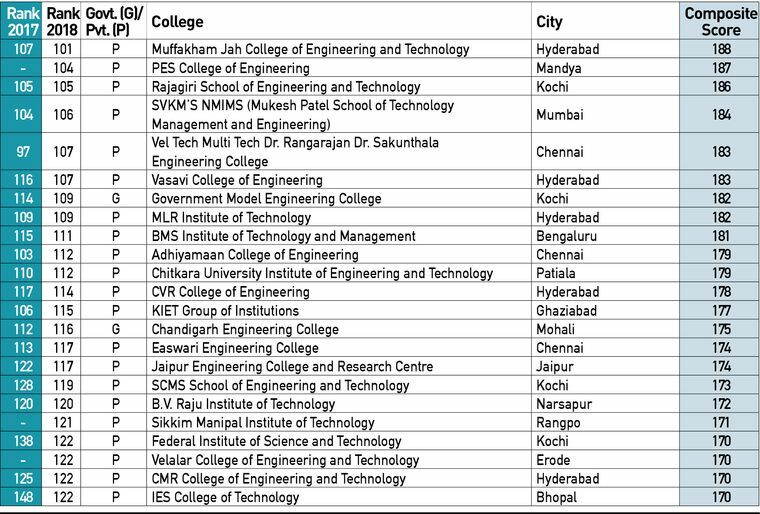 Education in India’s best colleges is a good mix of academics, soft skills and extracurricular activities. Along with relevant training in presentation skills, people skills, time management and language, students are encouraged to explore areas outside academics that they can excel in. With the human resource development ministry giving these colleges a push through its Rashtriya Uchchatar Shiksha Abhiyan, they seem all set to scale new heights. 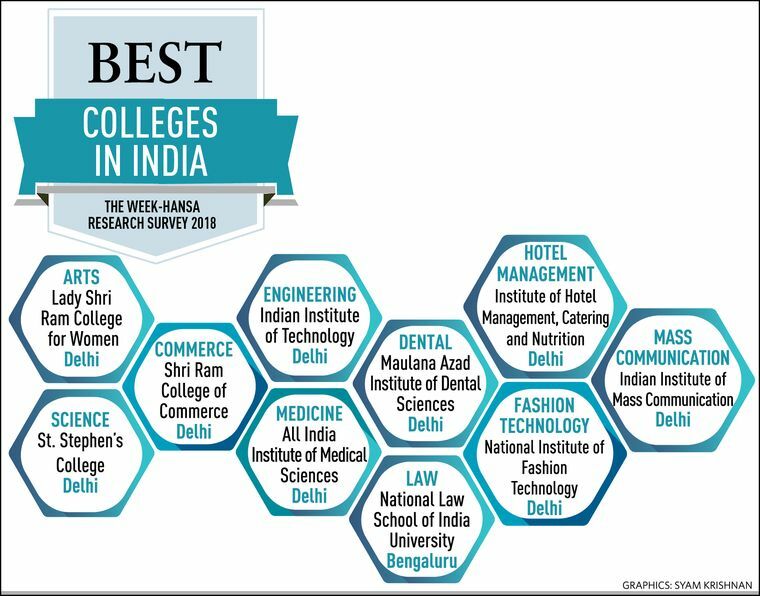 THE WEEK has been conducting the Best Colleges Survey in association with Hansa Research since 2009 to rank the top colleges in India. This year, the study was done across ten disciplines—arts, commerce, science, engineering, medicine, dental, law, hotel management, fashion technology and mass communication—and covered 24 cities. A primary survey was conducted with 735 academic experts, 2,155 current students, 1,030 aspiring students and 30 recruiters. The sample was selected ensuring proper representation of all cities and disciplines. 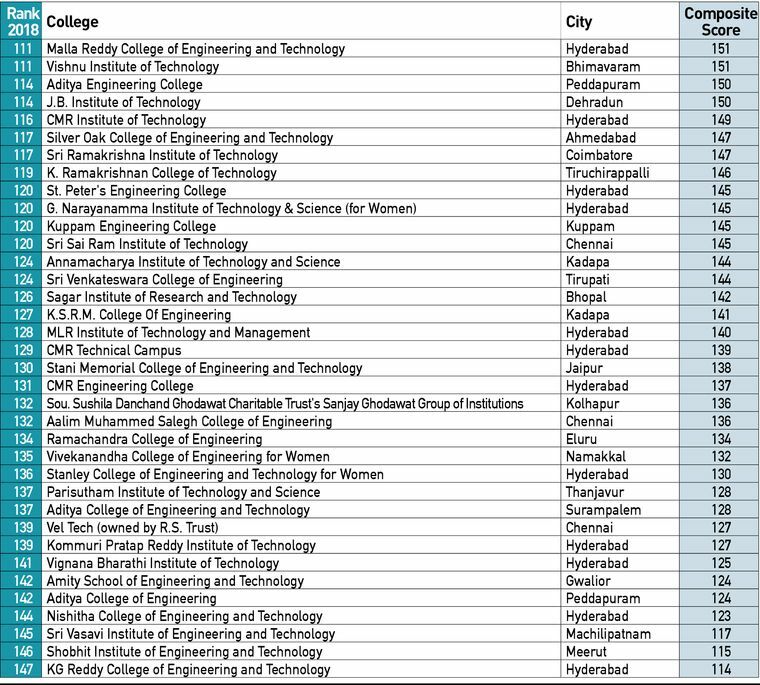 The respondents were asked to nominate and rank the 25 top colleges in India and top colleges within their city. Of the 3,950 interviews, 121 were qualitative. This helped get an in-depth understanding of the reasons for the rankings. Perceptual score was calculated based on the number of nominations and the actual ranks received. For factual data collection, a dedicated website was created and the link was sent to more than 3,000 colleges. Those that did not wish to be ranked were omitted. Factual score was calculated using the information collected from the colleges. This included age, accreditation and infrastructure, faculty, placements and extracurricular activities. Composite score = Perceptual score (out of 600) + factual score (out of 400) Some colleges could not respond to the survey. For them, composite score was derived by combining the perceptual score with an interpolated factual score based on their position in the perceptual score list.